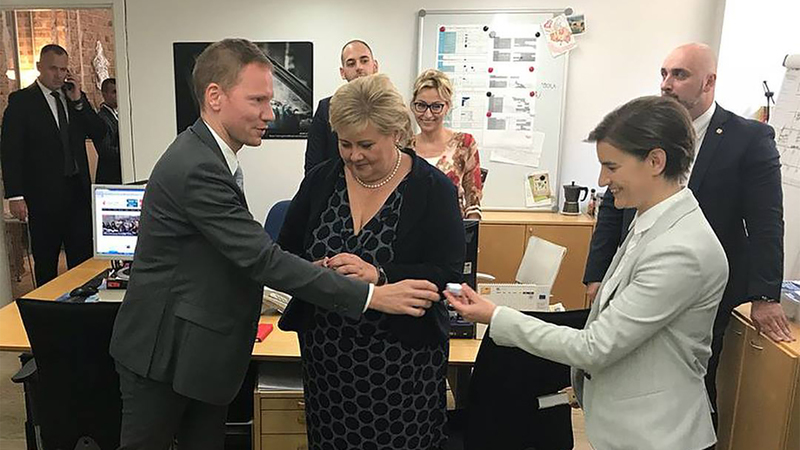 At the first stop on an official trip to Serbia, Norwegian prime minister Erna Solberg visited Human Rights House Belgrade with her Serbian counterpart Ana Brnabic. At the House, the politicians had the opportunity to engage in dialogue with members of Serbian civil society. Human Rights House Belgrade and the Norwegian Embassy agreed that the discussions would focus on the subject of human rights protection, with an emphasis on socio-economic perspectives and the right to work. These issues have been at the forefront of Serbian society in recent years. The conference was attended by representatives of all member organisations of the House, as well over 30 representatives of 20 organisations, including organisations specialising in social and economic rights, members of unions, and academics. Members of civil society were able to use the conference as an opportunity to insist on a more frequent interaction between the Serbian government and civil society regarding social and economic issues. During the dialogue, the Norwegian Prime Minister expressed her country’s interest in improving the mobility of workers, and underlined the importance of this mobility in providing further economic development. Solberg also shared her view that both countries stand to learn from one another, with the common goal of providing work for all citizens. Turning her attention to the host country, Solberg commented that Serbia needs to make further progress in the field of human rights, and not only as part of international obligations for the European Union, or for the United Nations, but for the benefit of Serbian citizens.